Is there anything better than sweet summer peaches and nectarines? I think not. 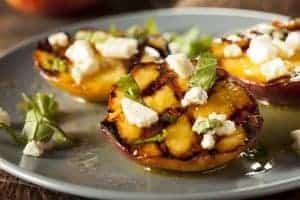 Make them better by throwing them on the grill and topping with creamy feta cheese or goat cheese. Add a delicious drizzle of your favorite vinegar (hint: Maple would be fantastic!) and you have a gourmet side dish without a ton of work! 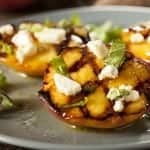 Brush nectarines or peaches with MTOO Butter olive oil and place on grill on the cut side down (flat side) until grill marks appear, about 4-5 minutes. Turn fruit over to rounded side and sprinkle with cheese and black pepper. Grill until grill marks appear, about 4-5 minutes.